Fresh from making its second investment in Indonesia yesterday, via its dedicated Southeast Asia fund, Japanese VC CyberAgent Ventures has announced that it is putting funds into Baitianshi, a social network that connects doctors and pharmaceutical companies in China. As with many deals from CyberAgent, the level of investment and stake being purchased has been left unannounced. Baitianshi was founded in December 2010 and it is a real-name social network (online aliases are very often anonymous or characterized in China/Asia) which allows doctors to improve their communication with pharmaceutical suppliers and firms. 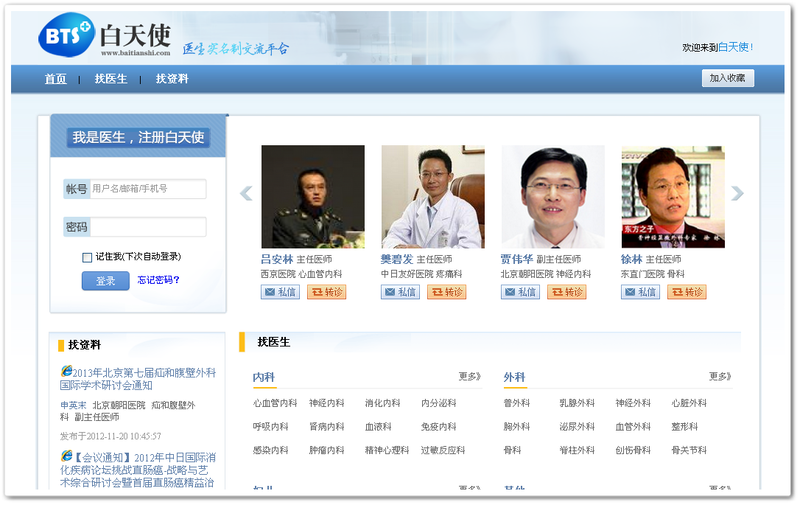 The company says it has struck partnerships with “major general hospitals in China” and that, to date, more than 200,000 doctors have used the site. The addition of capital from CyberAgent will see Baitianshi take advantage of the VC firm’s “wide range of resources throughout Asia”. The Internet has long been a bridge for personal relationships but the medical industry itself is beginning to see new advantages from the Web and social networks. While Baitianshi may be two years old, and very much business-to-business, DoctorPage — a Singapore-based service that connects doctors and patients — just landed funding in the last week too, for example. Started by Max Scheichenost, who was co-founder of now-Google-owned DailyDeal, DoctorPage grabbed undisclosed investment from a string of well connected backers, and is eyeing global expansion with two new market launches imminent. CyberAgent has been investing in China since 2006, and has backed more than 20 Web startups in the country during that time. The investment in Baitianshi, made via parent company BTS Healthcare Holding Limited, comes via its dedicated China fund — ‘CA-JAIC China Internet Fund II’ — which is jointly run with Japan Asia Investment. CyberAgent’s other recent deals have included Vietnam-based restaurant review site Foody and iCook.tw, a Taiwanese social recipe service.